A festive and colourful, healthy meal. Suitable for vegans when using the ingredients listed. A real eye catcher for the Christmas table! Cook the quinoa following the instructions on the packaging. Cut the beetroot into cubes and cut the shallots into quarters. Put the shallots and the beetroot cubes in an oven proof dish, coat with olive oil and salt and roast at 200C/gas mark 6 for around 45 minutes. Mix together the roasted beetroot, onion, red wine vinegar and mayonnaise and add the cooked quinoa. Grate the orange peel and add to the yogurt with the coriander. 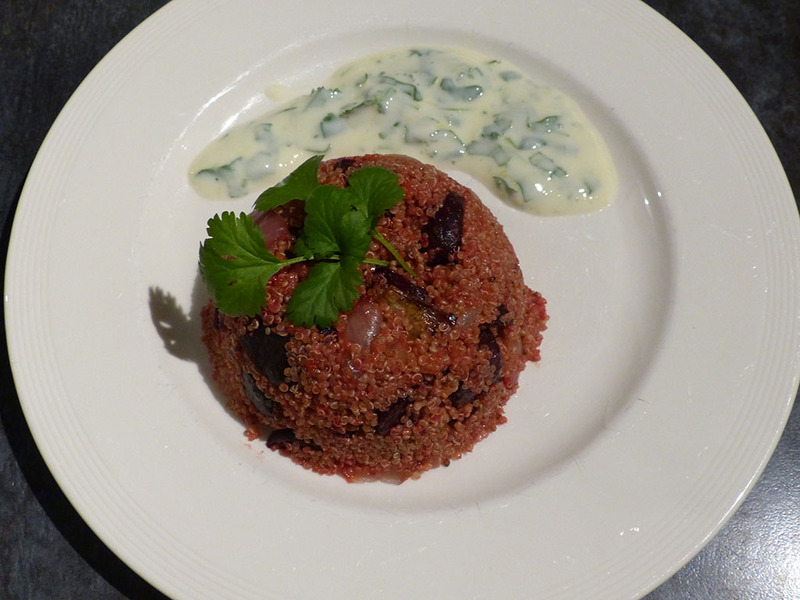 Serve the pink quinoa salad with the coriander yogurt.